You’ve all heard me say a million times how a girl can never have too many white tops! They look great with every color in your closet, can be dressed up with all kinds of accessories, and are the ideal blank canvas for creating a knockout outfit. 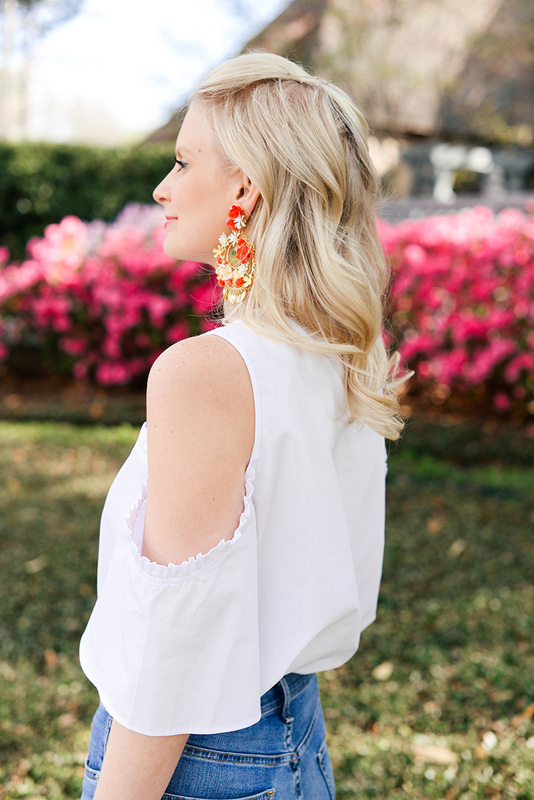 While I’m certainly all about investing in quality wardrobe staples, I also love snagging trendier pieces like this ruffle open-shoulder top for less. If there’s one place I like to go for fun, flirty and of-the-moment items, it’s ASOS. The fast-fashion brand is my one-stop shop for casual day dresses, breezy tops and more throughout the spring and summer months. I usually order a bunch of items and end up sending back half the stuff (sometimes the fit or fabric is off), but luckily they do free returns so it ain’t no thang. In one of my more recent hauls, I scored this cute top! You all know I love my ruffles, but it also taps into the cold-shoulder trend that’s everywhere this season. It’s the perfect piece to wear with colorful earrings and a punchy pout, don’t you think? The other color combo I’m loving right now is this green + yellow pair. Such a refreshing and juicy palette for summer! This single ruffle one-shoulder top is elegant and under $40! If you aren’t into color but still love the idea of a statement earring, try this raffia pair. So cool! A ruffle-sleeve tee you can pair with skirts and cut-offs this summer. This purple pair of earrings looks slightly smaller, but still packs quite a punch. This clean white OTS top is a great everyday staple for summer and is under $50! This teardrop shape is a little different from the others, but just as colorful and unique! This look is so fun, looking stunning girl! That top is so cute! It’s perfect for any occasion! This is just the cutest little spring outfit! I love how simple it is. The earrings are such a fun addition! You look amazing! That top is so pretty! And I love how you kept this look simple and chic! 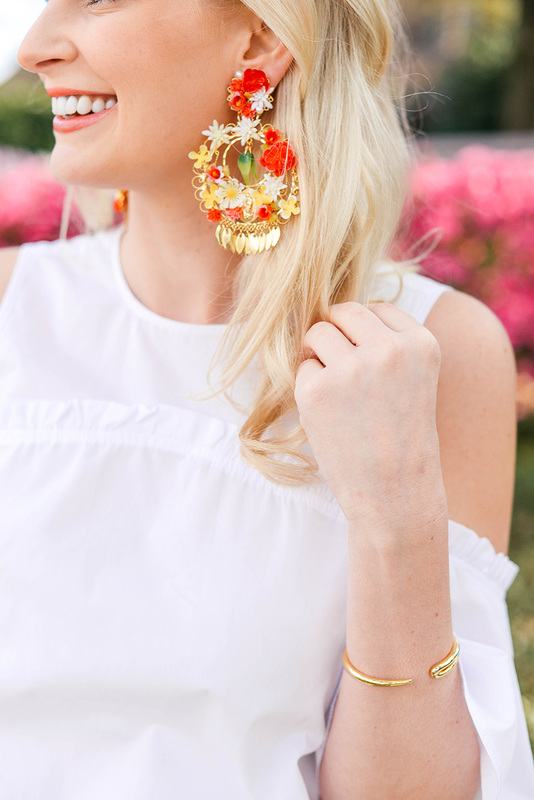 I have been obsessing over statement earrings lately! These are amazing! !